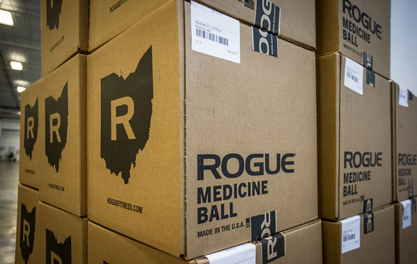 Rogue Medballs are handmade in the USA and feature a precision nylon thread seam construction with a moisture and scuff-resistant coated-vinyl shell. We started by making sure all seams are double stitched, then added a top stitch to the heavy range of 14LB thru 30LB variants. The interior filling is substantial enough to help the ball keep its shape across repeated use, but also forgiving and flexible enough for athletes to safely stop or catch the ball at high velocity. All of our medicine balls include a Two-Year Warranty* from the date of purchase. Rogue Medicine Balls is rated 5.0 out of 5 by 68. Rated 5 out of 5 by Spy242 from Balls to the Wall- Fantastic Quality! I purchased a 14 lb and 20 lb. So far they are meeting and exceeding my expectations. The weight does not shift which is important. 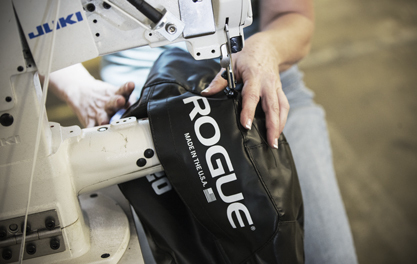 They handle well and the quality and stitching is top notch Rogue Fitness. I highly recommend them. Don't settle on less and pick up a pair. Rated 5 out of 5 by Jcramire92 from Perfect! Got the 30lb for Christmas and love it! The material feels better than other wall balls I have used before and it has that Rogue quality I know and love. The weight doesn't shift in the ball, so no need to worry about catching it funny. Rated 5 out of 5 by Ace310 from Solid A few WODs in and it's been nothing but an honor to support American jobs. Rated 5 out of 5 by Domins from Best Balls Ever These balls are the best. 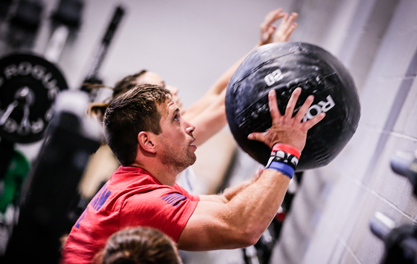 Wall balls, odd object carries, weighted sit ups... you name it you can do it. They hold up well under stress, especially when you are tired and drop them or allow them to catch themselves on your face. Good padding... but also firm enough to really get a grasp on them to throw around. Price is decent and delivery is quick. Can't complain here! Also my 11 month old loves to climb on this. It's heavy enough not to roll on him, soft enough to fall on, and the perfect height to pull up on. I'll probably order one for him when he is bigger. Rated 5 out of 5 by Tony Garage Gym from Great Quality Got this for the woman. 14lbs. Its craftmanship is what to expect from Rogue. Great piece of gear, highly recommend. Rated 5 out of 5 by Serling213 from So far, so good! There's two things a medicine ball should not do: 1. Warping shape after hitting the ground a few times. 2. Slipping from your hands due to a little sweat. This medicine ball has done neither so far, which in my opinion, is easily enough to warrant a five star rating. I would recommend this ball to anyone. Rated 5 out of 5 by GP NW from Competes with the best I was stoked when Rogue started making these... these get the job done and look great. The cover is really durable, same material as the foam games box. No reason to pay more for other brands... these are high quality.